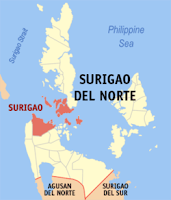 Two separate earthquakes struck Surigao City, Phivolcs said, but there were no immediate report of damage or injured. The first quake, with a 3.8 magnitude, struck at 11:04pm, Sunday, Nov. 6, at a depth of about 85 km Northeast of Surigao City. Intensity 1 was felt in the city. The second quake, with a 2.3 magnitude, struck at 5:10am today at a depth of about 22 km Northwest of Surigao City, Phivolcs said.